Cet ouvrage rassemble les contributions majeures données depuis trente ans par Jacques Poumarède, le professeur émérite d’histoire du droit à l’Université de Toulouse-Capitole, un spécialiste des coutumes successorales du Sud-ouest. On trouvera dans ce volume des chapitres consacrés à l’histoire des droits familiaux et patrimoniaux tant pyrénéens que français et les réflexions sur les diverses approches d’écrire l’histoire du droit ainsi que sur les origines épistémologiques de la discipline. François Jean Marie Olivier-Martin (1879-1952) was a prominent legal historian, doctor of law, and a professor of legal history. He began his academic career at the Faculty of Law of the University of Rennes in 1909. In 1921, he succeeded the famous legal historian Emile Chénon as director of the course on legal history of the University of Paris, where he taught until 1951. Olivier-Martin was a prolific scholar who published more than 60 articles and 9 monographs. His 3 major works unrivaled in their use of primary sources and the breadth of the synthesis are still inevitably cited by scholars writing about the history of pre-revolutionary French law. For his academic achievements Olivier-Martin was awarded multiple Doctor Honoris Causa, the Chevalier of the Legion of Honour in 1932 and in 1936 was elected to the “Academie des Inscriptions et Belles Lettres”, one of the five academies of the Institut de France. 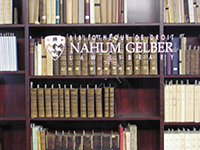 In 1956, Doctor Jean-Gabriel Castel, a Professor at the McGill Law Faculty began the negotiations to purchase Olivier-Martin’s collection, which at the time was one of the most comprehensive private law libraries in France. The negotiations were successful, and the library was acquired with the funds generously donated by a former McGill graduate, Arnold Wainwright, a prominent Montreal practitioner, a long-time associate and friend of the Faculty of Law and a part-time lecturer in Civil Law, which he taught at McGill for twenty-five years. On February 8, 1958, Olivier-Martin’s library of some 770 titles was formally presented to the McGill Law Library and officially renamed the Wainwright Collection. The generosity of Arnold Wainwright, continued through the Wainwright Trust, has enabled the Faculty of Law to purchase in the antiquarian book market many additional titles of interest to add to the original bequest of 1958. 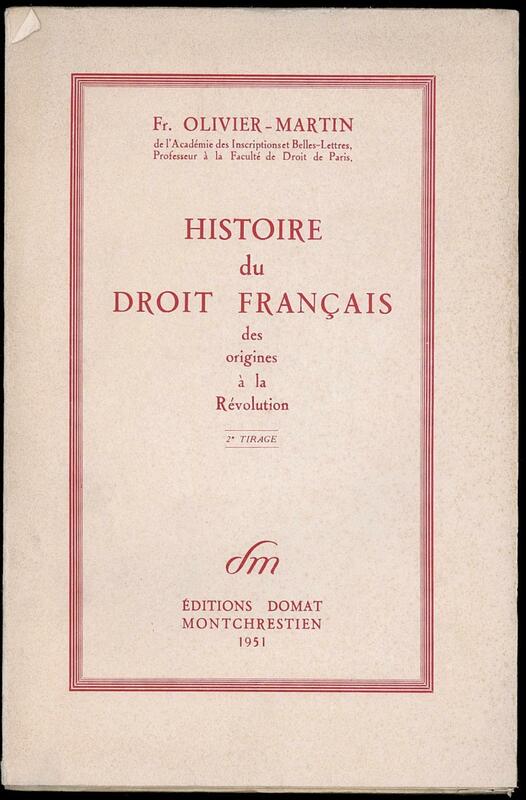 The Wainwright Collection today consists of over 1500 titles on the history of the pre-revolutionary French law. The current exhibit features selected titles that represent the subject focus and the breadth of the original Olivier-Martin library as well as archival documents pertaining to the history of acquisition of the collection. Olivier-Martin’s library consisted of contemporary commentaries and rare materials on the law of Ancien régime. His library reflects with remarkable accuracy the academic interests of its former owner with three major themes of the collection: French customary law, History of professional corporations, and History of pre-revolutionary French law crystallised in his three the most significant works: Histoire de la coutume de la prévôté et vicomté de Paris (1922-1930), Organisation corporative de la France d’Ancien régime (1938), and Histoire du droit français des origines a la Révolution (1948). As of today, the vLex database, has moved to a new platform. The new vLex is more user friendly and has a new design with more options and filters to perform more quick and precise searches. You can access and download the user guide to the new vLex platform here.